A random idea. 30 minutes of spare time. And voila, we have a side project. A completely useless one, as well. 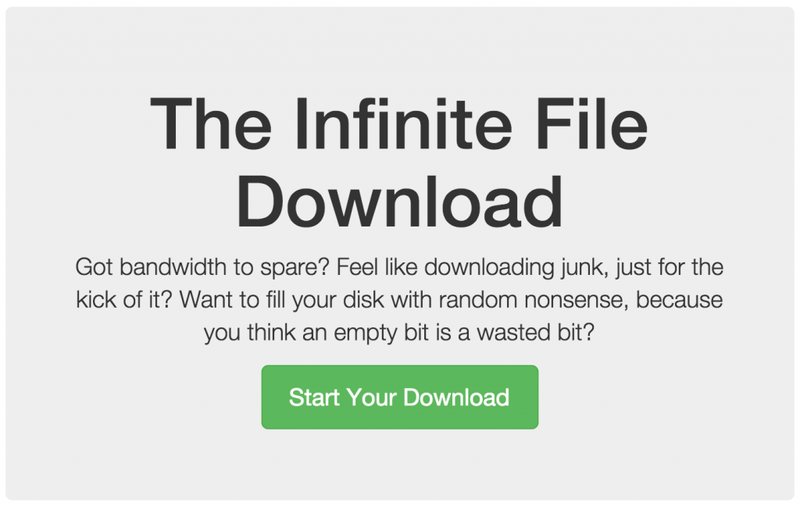 I present you: The Infinite File Download. Why? Because! What is it? A PHP file that just keeps on sending binary data to your browser, as soon as you hit download. It never stops. It'll download as quickly as A) my little server is capable and B) as fast as your line supports it. Want to test the speed of your downloads, just by downloading random bits and never saving it to your disk? Pipe it to your local trashbin, /dev/null. I'll also kill this project as soon as the bandwidth exceeds a randomly determined "fair use policy". The source is up on Github. The landing page theme is the Narrow Jumbotron Template from Bootstrap. Perhaps I could use this to make a statement about "unlimited" bandwidth providers, but I'll keep that rant for another time. For some reason I want this. I had the same feeling, like my life just wasn’t … you know … complete, without it. Perfect to piss people off at school with a shitload of network conjestion. I get between 1.3 and 2.0 MB and then it stops. Tested with Iceweasel and wget. Same machine, same connection… and now it works. wget gets met 10,3MB/s (Telenet) which is about my top speed I believe. Great product, I’m using this to try and get my ISP to assign bandwidth to me so my speeds will go up. I’ve had minor success with upload and download. The only thing I have noticed is that it will cut out around 15-16GB. Could you investigate?